The weather today will bring fair clear skies with moderately warm temperatures. The high will reach 63° with a low of 44°. A fake news report that an armistice had been signed with Germany and the war over sent the country and this city into wild celebration yesterday afternoon. The report came through the United Press service which has more than once had its reputation for accuracy and the authenticity of its reports questioned. The news reached Philadelphia at 12:15pm. Almost immediately crowds began to fill the streets. Offices in the central business district began to empty. A “snowstorm” of white gently fell onto revilers in center city. These artificial snowflakes were pieces of paper thrown from the windows of office buildings. The “storm” went on for 2 hours. Brass bands appeared playing every patriotic song in their repertoire. Thousands of human voices joined in song, laughter, and shouts of joy. Factory whistles were blown and church bells began to ring. Factories and mills declared a half day for workers. The owners and managers of these businesses led their employees in impromptu parades around the neighborhoods where they are located. On the waterfront, every shipyard released its employees from work to celebrate. All the munitions factories did the same as did the Frankford and Schuylkill arsenals. Eventually the public and parochial schools dismissed their charges to allow the children to join the carnival. City government virtually closed down. Even Mayor Smith was overtaken by the spirit of celebration. He ordered the ringing of the Liberty Bell at Independence Hall. Hundreds of church bells followed. The Mayor also ordered City Hall decorated with every flag and shred of bunting that could be found. More flags appeared among the joyous multitude. Not just the Stars and Stripes but the flags of all the allied nations. Also carried proudly aloft were the service flags of businesses, fraternal organizations, churches and neighborhoods. It is estimated that almost one million people poured onto the streets in celebration. As the afternoon went on a huge crowd gathered at the Liberty Statue on South Penn Square at City Hall. 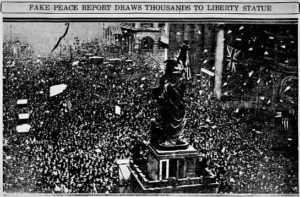 The news of the armistice was taken at face value since it came from a news gathering organization. Even the authorities in Washington D.C. were caught off guard. That led to a delay in an official denial. But even after the government denied the report it took hours for it to filter across the nation and into the crowds here. At some locations people were still celebrating at midnight. The worst part of this canard came later, especially for the families of the men still “over there”, when it was learned it was all a lie. These families keenly felt the disappointment and sadness in the realization that their boy was still in danger. And many a woman who had just hours earlier shed tears of joy that her husband or son was coming home, now wept in grief. The terror they had lived with, which had briefly been lifted, returned tenfold and with it came anger at those who perpetrated this cruel hoax.